We've gathered a collection of resources that will help inform and enrich different aspects of your readiness plan development: from ideas for new ways of engaging with your listeners online, to fresh sources of content for your website; from social media ethics guidelines, to non-profit fundraising best practices in times of emergency. There are sample readiness plans shared by fellow public broadcasters. And you'll also find the archives of a series of emergency readiness webinars that will be scheduled throughout 2010. You can access the NPR API to display NPR content directly on your website. You don't have to be an NPR member station to use the API - it's simply a tool that allows for transfer of content among websites. NPR's API allows individual users to pull content from npr.org and weave it into your website, smart phone app, and so on. FluPortal , an archived project of crisis-reporting and web tools for public media, offers a good example and easy instructions for you to learn how to get an API key and use NPR content on your site. Many public safety agencies and other sources of reliable information have twitter accounts. These can be a good source of up to the minute information. Every Twitter account produces a unique RSS feed. The feed URL is found near the bottom of the right sidebar of every account profile page. Twitter also offers a customizable search widget which you can embed on your site. This search widget can display tweets based on specific keywords or by tweets from specific users, such as the CDC and Flu.gov. We don't recommend posting a search for "H1N1" or "swine flu" without pulling them from credible source(s), as the quality of information is low. Crisis Commons has rolled out the OilReporter app for iPhone and Android, for crowdsourcing reports of the Gulf oil spill. UN Foundation report: "New Technologies in Emergencies and Conflict: The Role of Information and Social Networks"
Listen to the archive of the April 22 webinar. Listen to the archive of the May 20 webinar. Listen to the archive of the July 29 webinar. Listen to the archive of the August 31 webinar. Listen to the archive of the Sept 30 webinar. Engaging with our community for disaster planning and response, presented in partnership with NCME, the National Center for Media Engagement. Watch and listen to the webinar archive here. 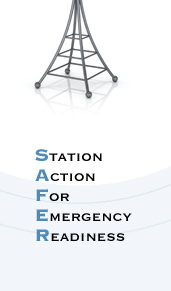 SAFER has presented materials at the NFCB, PRNDI, PMDMC, PRPD, ERPM, APRN and NETA conferences.